Nancy, What's Up With That? Did you move your blog? I have moved this blog to NancyJester.com You may go there and sign up for notifications and read up on the latest in education in Georgia and around the Country. Grover Norquist, Americans for Tax Reform, and the Cost of Government Center announced their support of Nancy Jester today in the Republican Primary for Georgia State School Superintendent. “ATR and COGC laud the efforts of Ms. Jester to improve the education system in the state of Georgia through sensible spending, increased transparency and strong accountability” said Norquist. Mr. Norquist is the president of Americans for Tax Reform (ATR), a taxpayer advocacy group he founded in 1985 at President Reagan’s request. Please help spread the word by forwarding this email to your friends and family. Ask them to join you, Grover Norquist, Erick Erickson, Sen. Josh McKoon and former Sen. Eric Johnson in voting for Nancy Jester, the proven, effective, conservative candidate for Georgia State School Superintendent. With all of the talk about recent weather and traffic events, we’ve lost an important education story. Georgia, has now become the first and only state to forfeit Race to the Top (RT3) grant money. Officials in Georgia were warned last July to address failures in implementing a new teacher evaluation system or lose almost $10 million in funding for a teacher merit pay system. On September 16, 2013, I notified the State of my intent to withhold $9,904,629, pursuant to sections 454(a)(1) and 455 of the General Education Provisions Act (GEPA) (20 U.S.C. § § 1234c(a)(1) and 1234d), until the State submitted a credible plan detailing its strategy for coming into compliance with this section of its Race to the Top grant. To date, the State has not submitted such a plan. ….. To date, the OALJ has not received an application for a hearing nor have I received a written show cause response. As a result, the Department is withholding $9,904,629 of Georgia’s Race to the Top grant award, effective with this letter. I’m not a fan of some of the aspects of RT3 but if the state commits to it, one has an obligation to manage it properly. Whether you like RT3 or not, this is an embarrassment at the national level for Georgia. The headline draws attention to the poor state of affairs regarding education management in our state. Furthermore, it removes funding that would have gone to our best performing teachers. 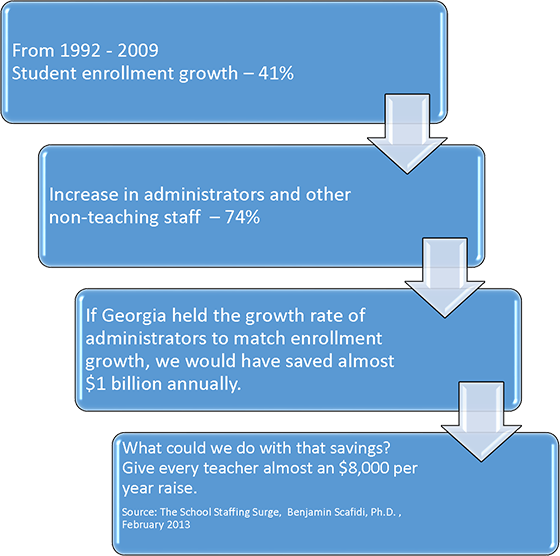 Georgia’s Department of Education created the very evaluation system they failed to implement. The evaluation system had problems from the start. The length of the 358-page evaluation handbook is a clue that the system may have failed under the weight of its own complexity. Given that it is National School Choice Week, the story of a failed evaluation system is ironic. The simplicity and equilibrium of parent choice in education as a metric and driver of success is all the more compelling, compared to the byzantine and lengthy teacher evaluation system created by bureaucrats. Georgians deserve more choice and less bureaucratic failure. I am pleased to hear the DeKalb school system’s accreditation status has been upgraded from “probation” to “warned”. I worked diligently to shine light on the poor fiscal management of DeKalb. Some of my work was even cited in the SACS report from 2012. Clearly DeKalb still has a long way to go. Academic achievement and growth in many schools is unacceptable. DeKalb’s graduation rate, at 58.9%, is far too low. Of the 25 high schools in DeKalb, 8 have graduation rates below 50%, while only 4 have rates above 75%. All four of these schools are specialty or magnet schools. I appreciate that SACS finally recognized that DeKalb needed some sort of intervention. The entire episode exposes the structural weaknesses in our state’s accountability model. While SACS can provide a useful and supplemental service via their third party accreditation products, Georgia must not continue to abdicate it’s role in holding districts accountable for their results and financial management. AdvancED/SACS has 5 standards for school district accreditation. While these standards are meant to drive improvement in various processes for a school district, not one standard measures outcomes for children. There is no minimum graduation rate or achievement level necessary to earn accreditation. In many states, the accreditation status of schools is determined by their Department of Education or comparable public agency. Texas and Virginia both accredit their schools based on defined, measurable performance results. Their graduation rates are 87% and 89% respectively. These states are rewarding success with autonomy and no longer accept failure without consequences. Additionally, Texas has a Financial Integrity system that has 20 indicators that measure the financial health of a district and push money to be spent in the classroom. Georgia has 0 financial integrity measurements for our school districts. If Georgia had a system for financial integrity, like Texas, DeKalb county could not have engaged in the deceptive budgeting practices I uncovered. School districts would be forced to allocate money to instruction and not a bloated bureaucracy. If Georgia’s Department of Education had an accreditation system like that of Texas or Virginia, our schools would be rated and accredited based on measurable performance outcomes. I am running to be the State School Superintendent to bring these types of structural reforms to our state. On the campaign trail recently I’ve been talking about how much Georgia spends on education and how that relates to outcomes for our children. Georgia’s total budget took quite a hit from 2008 to 2010 (the top yellow line). 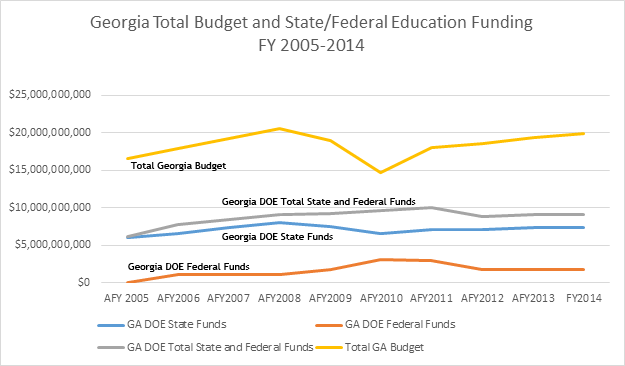 Georgia’s state funding for education dipped during that same time frame (the blue line) but took nowhere near the hit that the entire state was forced to endure. Additionally, the federal government stepped in and made up for most of the decline with stimulus funds. The grey line shows total state and federal education spending. What’s the real story behind Georgia’s education system and funding? Every state that borders Georgia spends less per pupil and has a higher graduation rate. For the record, since 2012 (for the 2010-11 school year) the graduation rate is calculated the same in every state. See my chart below for the data – border states are highlighted in peach and other notable states are highlighted in blue. It’s worth noting our two lowest spending border states have the highest graduation rates – Tennessee and North Carolina. In October, the Marietta Daily Journal published an article I wrote about Common Core, Common Core is No Path to Prosperity. Subsequently, Politifact ran a piece examining my comments about Georgia’s aggregate spending on education. They confirmed that, indeed, Georgia does spend in the top ten on education in the nation. Click here to review the U.S. Census data on that. The Politifact article went onto discuss per pupil spending by state – a topic that I did not address. Their point was that if one reviews per pupil spending, Georgia’s ranking drops significantly. They further indicate that ranking drops, “when adjusted for regional costs of living…”. The citation embedded in their article for this claim doesn’t given the adjusted per pupil data, rank or methodology used for adjusting the figures. It’s fair to assume that their per pupil spending data is adjusted using CPI information by region (their stated level of adjustment). I was pleased that Politifact noted that my fact on aggregate spending was correct. Pursuant to their further critique, they would have preferred I discuss per pupil spending. The main reason I did not discuss per pupil spending is there are significant differences in the wage structures for education professionals and their benefits between states. The largest components of costs in K-12 education are salaries and benefits so adjusting each state relative to each other would be necessary for an accurate comparison. I downloaded the Bureau of Labor Statistics’ most current Occupational Employment Statistics to gather salary/wage data for each state. I isolated those occupational profile codes specific to K-12 education in each state. I averaged these wages to determine an average salary. I then compared this average salary to Georgia’s average salary. As you would expect, some states have significantly higher salaries than Georgia. These states are often those that we think of as having a higher cost of living. For example, adjusted against Georgia’s salaries, New York’s educational salaries are 31% higher; Massachusetts are 17% higher. After developing a measure between Georgia and every other state, I used this to adjust each state’s per pupil spending relative to Georgia’s and then ranked the states’ adjusted per pupil spending. The result is that Georgia’s per pupil spending is in the middle of the pack. We rank 25th in per pupil spending on instruction and 28th in total per pupil spending. I’ll leave you with this. Every state that borders Georgia has a higher graduation rate. And, every state that borders Georgia spends less per pupil than Georgia. You can go west to Mississippi, Louisiana, Texas and Arkansas and you will find that they too, also have a higher graduation rate and all but Louisiana spend less per pupil than Georgia.